A deck is a great addition to any home; it’s the perfect entertainment and relaxation space where you can spend leisurely moments with your family and friends. In most instances, the deck also becomes an integral part of the indoor living spaces and many homeowners get it constructed to add expansiveness and openness to their home. We at Productive Quality Construction are a property maintenance and full service construction company situated in Atlanta, GA. Over the years, we have built a very solid customer base here and cater to clients in and around the entire metro Atlanta area. We also serve customers in Gresham Park, Druid Hills, Decatur and North Decatur; and have successfully completed projects across North Druid Hills and East Point, as well as Belvedere Park. Our company has also handled a significant number of projects in Panthersville, College Park, North Atlanta, and the surrounding areas. A wooden deck can be installed in any open space on your property and we provide custom deck design and installation services at very reasonable rates. A deck increases functionality of your backyard and we can design this feature in such a way that it flows seamlessly with the design and layout of your home. Many of our customers want pool decks installed and we handle those jobs as well. If your requirement is for multi-leveled decking, we can construct that too. Space - Our designers will survey the spot& assess various features in the landscape. 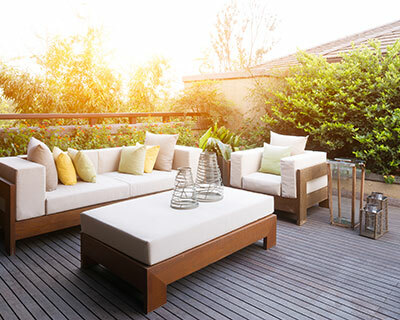 Placement - Sometimes the outdoor spaces don’t provide flexibility in terms of the location of the deck; however, there are situations in which there is plenty of space. Our designers can provide recommendations on which spot would be perfect for the deck so you get the best views of the surrounding spaces. Materials - Decking is exposed to the elements and this makes it important to choose the materials with care. Timber decks are still preferred by many over newer materials such as vinyl, aluminum and composite. Type of Installation - You have the option to choose between an open deck and a semi-enclosed one. If you like, we can also construct a pergola and install shade structures on it. If you are looking for high-quality, customized deck design services, Productive Quality Construction is the company to contact. Feel free to call us on 770-217-7560 and discuss your project details with one of our experts. We provide end-to-end solutions at very cost-effective deck construction cost.